1. Adheres objects to a pot. Attaching handles, decorations, etc. this usage of clay slips is found on the Handling page. 2. Used in the mass production of molded pottery. 3. The stage at which raw clays can be blended. 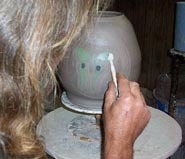 it becomes to a potter as oils are to a painter. 5. 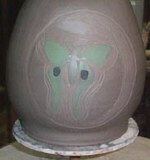 Used to enhance glaze firing affects. In this section we are concentrating on Painting your clay body with slips. with just enough water to form a batter like consistency. Stir, make sure the slip is free of lumps. depending on which type of clay is used. stoneware clay slips are made with stoneware clay and so on. such as glaze color flashes. Slips can take on the characteristics of the clays from which they are made. that were present at the digging site. and more rare and some are even quite rare and very hard to acquire. Once such type is Albany slip The clay supply for this slip is no longer mined commercially. Albany slip is available only sparsely. 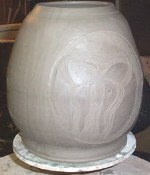 firing based on the firing point of the particular clay type used. the slip may liquify and flow glazing your pot. 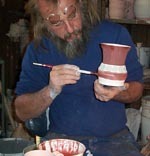 various firing conditions is essential to a successful piece. which is covered at depth on the glaze and firing pages.